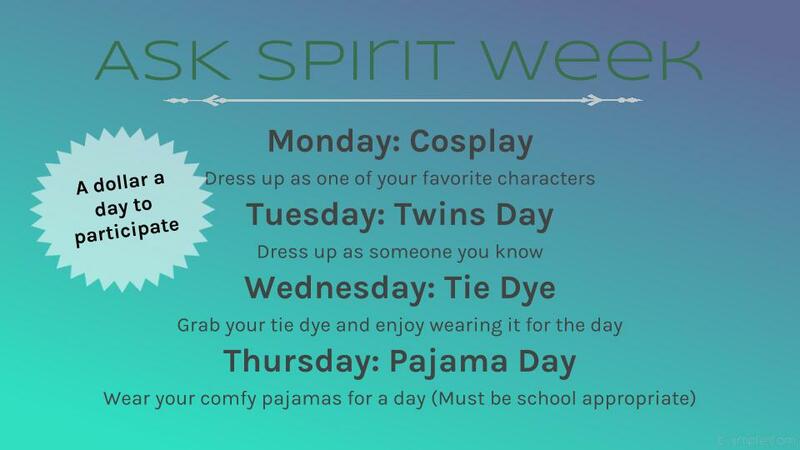 Next week will be ASK’s annual Spirit Week as we head into prom. Although prom is only for high school scholars, ALL students can participate in Spirit Week. In order to participate, you must pay $1 a day. A booth will be set up in the rotunda where money will be collected and receipts handed out. All of the money will go toward Dance Committee. Contact Mario Andreatta or Ms. Del Curto with questions. Monday, April 18: Cosplay Day. Show up as your favorite television, movie, book, or comic character and let everyone know what you really do outside of school. Tuesday, April 19: Twin Day. This day everyone will be seeing double! Come dressed in sync with your best friend, or dress up as someone at this school. Wednesday, April 20: Tie Dye Day.Come decked out in those swirls for this colorful day. Thursday, April 21: Pajama Day. To wrap it up, scholars get to show off their very best side; the one that has rolled off the bedside! Come adorning your best onesie and bed hair so that the camera can capture you in your finest truest form. Remember, this must be school appropriate, meaning no shorts, no midriff and no strappy tops.